· Time to next Christmas Eve. · Time to summer vacation. · Days from first kiss. · Weeks from last cigarette. · Days from last drink. · Days, weeks from child was born. · To change reported event just swipe on event description and choose event you like. · To choose how time is presented swipe on time show and select format you like – app supports many different formats: years, moths, weeks, days, hours, minutes, seconds and some combinations of them. 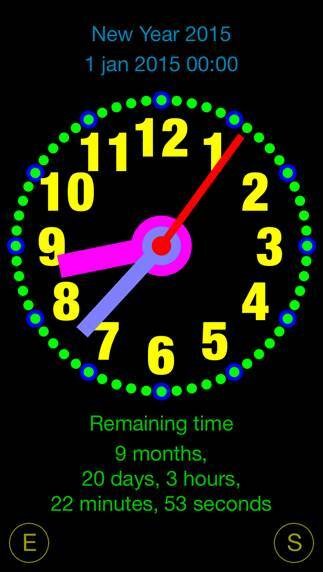 TimeIt app contains also analog clock showing current time. App is totally customizable - to change app look just tap on part you want to change and adjust settings. Changes are visualized immediately. TimeIt is delivered with many predefined themes, which can be easy customized. New themes can be created by duplication of existing themes. App contains also small set of predefined events such as New Year, Christmas Eve and Easter. App supports iCloud data synchronization – TimeIt events, themes and settings on all iOS devices with same iCloud account will be synchronized. You can create infinitely many new events and themes, which will be automatically shared by all your iOS devices. TimeIt utilizes new iOS7 feature: Background Fetch – app status is updated in the background.